SAN DIEGO — U.S. Rep. Duncan Hunter was swarmed by several dozen demonstrators yelling "shame on you!" 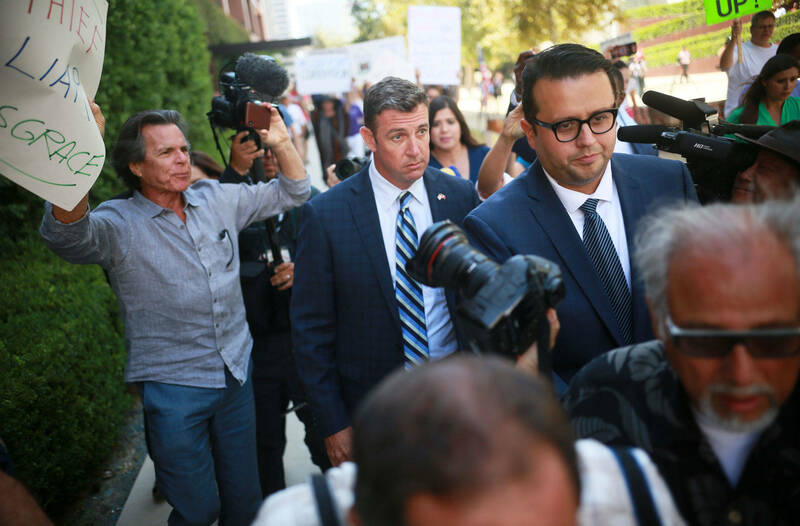 as he left a federal courthouse Thursday in San Diego after pleading not guilty to charges of illegally using his campaign account for personal expenses. The California Republican and his wife, Margaret, entered their pleas in federal court, where prosecutors said bond could be set low because the couple is living paycheck to paycheck. The judge agreed to set bail at $15,000 for the congressman and at $10,000 for his wife. After the arraignment, demonstrators holding signs that read "Duncan Hunter Ethics and Integrity Matter" and "Crooked Duncan Hunter" followed him as he walked to a pickup truck. He got in and removed a "Lock me up!" sign shoved onto the windshield as he was driven away. A 60-count indictment unsealed Tuesday charges the couple used more than $250,000 in campaign funds to finance family trips to Italy and Hawaii, golf outings, school tuition, theater tickets and even fast food purchases, and then attempted to conceal the illegal spending in federal records. Even as the five-term incumbent was under investigation by the FBI, Hunter easily finished first by a 30-point margin in a June primary and established himself as a strong favorite to hold onto California's strongly Republican 50th Congressional District in San Diego and Riverside counties, where his father held the seat for many years. Hunter's attorney, Gregory A. Vega, has claimed there was politically motivated pressure to tarnish Hunter before the general election. In a statement, House Speaker Paul Ryan called the charges "deeply serious" and said Hunter will be removed from his committee assignments, pending resolution of the case. House Democratic leader Nancy Pelosi said Ryan should call on Hunter to resign. The California Secretary of State's Office said there is no process in the elections code for Hunter to remove his name from the ballot, and there can be no write-in candidates for the November election. Hunter's opponent in the general election is Ammar Campa-Najjar, 29, a Democrat who has never held elective office. He received 17 percent of the votes in the primary, coming in second to Hunter. The top two vote-getters in California primaries advance, regardless of their party affiliation. Speaking with reporters in Point Loma on Wednesday after going on a fishing trip with wounded veterans, Hunter fought back against the allegations of campaign misspending. "Number one, I’m going to have an election," Hunter emphatically said. "I’m not resigning." "There’s a trial -- this means nothing," he said. "And the indictment is all they (U.S. Attorney's Office for the Southern District of California) have. They only have what you’re now seeing, that’s it. I’ve done nothing wrong. I say bring the trial now." Hunter also said the U.S. Department of Justice is conspiring to flip the 50th Congressional District from Republican to Democratic. "This is the U.S. government, what I would call the deep state," he said. "Or folks in the U.S. government who don’t care what the election does, they want to rig the election in their own way ... The DOJ is politically motivated. They’re going to slam this thing in right now, they could have done this in the last two years." The indictment alleges Hunter and his wife dipped into campaign cash for years to bankroll their lifestyle, while their household budget was awash in red ink. The spending ranged from the banal to the lavish, from movie tickets to a $6,288.74 family vacation at a resort in Hawaii. "The Hunters spent substantially more than they earned," the indictment said. "They overdrew their bank account more than 1,100 times in a 7-year period resulting in approximately $37,761 in 'overdraft' and 'insufficient funds' bank fees." Hunter said before becoming elected, he did not oversee his personal finances and instead relied on his wife to handle them. "It’s my responsibility," Hunter said. "It’s my account and I didn’t have enough personal visibility with my finances as I should have." Despite the allegations, Hunter remains confident he will be elected again in November. "We’re going to court," Hunter said. "And I’m going to win in court and win my election and we’ll see where we are." Hunter has called the investigation into him biased, as he said one of its prosecutors attended a Hilary Clinton event.